I arrived in Taipei at the end of November, the night was balmy and overcast. As the bus from the airport (conveniently frequent) drove me to my hostel I saw the lights and shadows of the city for the first time. Two things stick in my mind from that first evening. The fact that Taiwanese people use their garages as dining rooms, and a fat, scantily-clad girl sitting alone in a betel store, looking back at me. The first thing to remember about Taipei is that it is a capital city. People are busy and hardworking, favouring rules and order to taking things easy or slowly. Taipei has all the amenities of any 1st world country, including food, films, music, bars etc. As a result, in South East Asian terms, Taipei can be quite expensive. Another big difference between Taipei and its South East Asian counterparts is its climate which is neither tropical nor particularly sunny. 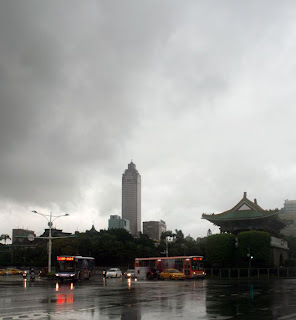 Taipei is very wet. Very Very wet. There is a typoon season from June to September, followed by a rainy season from October to February. Do not get these two confused. During the monsoon season there are massive storms, winds and rain. During the rainy season it just rains, and rains and rains. If you go in this period expect sunshine one day out of 10. For the rainy season which is also winter, it can get a little chilly at night, so bring a warm jacket and trousers. When the sun comes out it can suddenly get warm, so be prepared for big temperature changes. For the summer months, bring a light raincoat, but its going to be hot and uncomfortable so don't pack too much. Obviously if you're going to other parts of the country where there are high mountains you will need more. Although it doesn't get as hot as the tropics, or as cold as more Northern lands, the humidity can make things very uncomfortable all year round. There are also very many mosquitoes. If you are staying a long time, buy an electric mosquito repellent for your room, and keep the mosquito nets closed at all times.